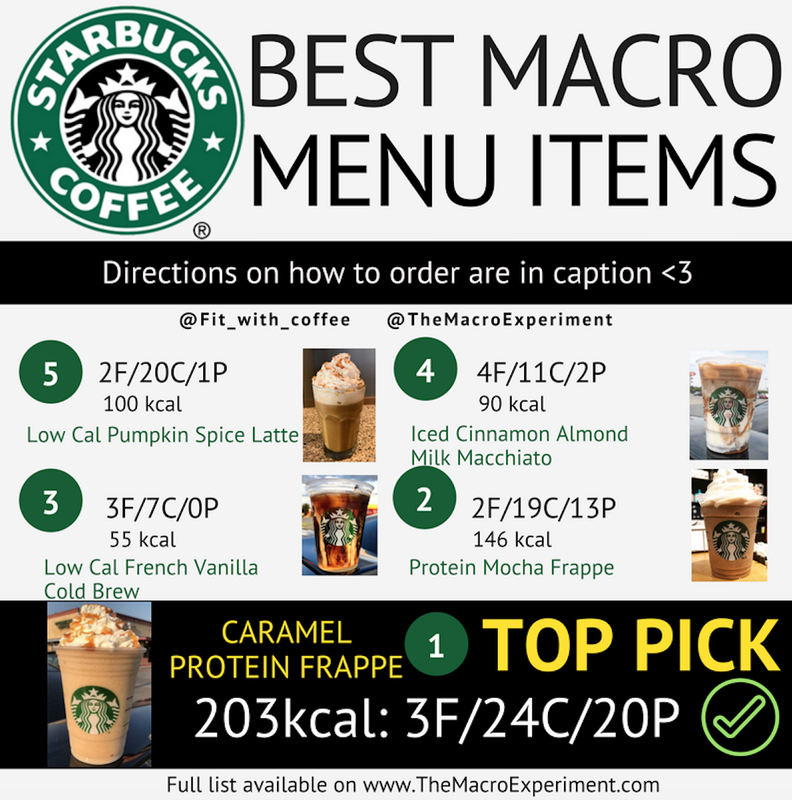 Favorite New Macro-Friendly Recipes and Updates!! What is up my friends?? I took a little break and went off the grid for a bit, but I am back and ready to blog it up! ;) I'll definitely get into more details on the personal life stuff and this new "chapter" I'm entering into soon! Today's post is all about new RECIPES!! Over the past few months I've created HUNDREDS of macro-friendly recipes for Avatar, so I wanted to make a blog post on here to share some of my favorites with you guys! If you make them and take photos, please tag me on IG @TheMacroExperiment & @AvatarEats! I'm also going to update the fast food and chain restaurant lists this week so stay tuned!! 2. Melt light butter and combine with applesauce and molasses in mixing bowl. 3. Add all other ingredients and mix thoroughly. 4. Pour into small cast iron skillet or 6-7" ramekin. 5. Bake for 15-20 minutes and enjoy! 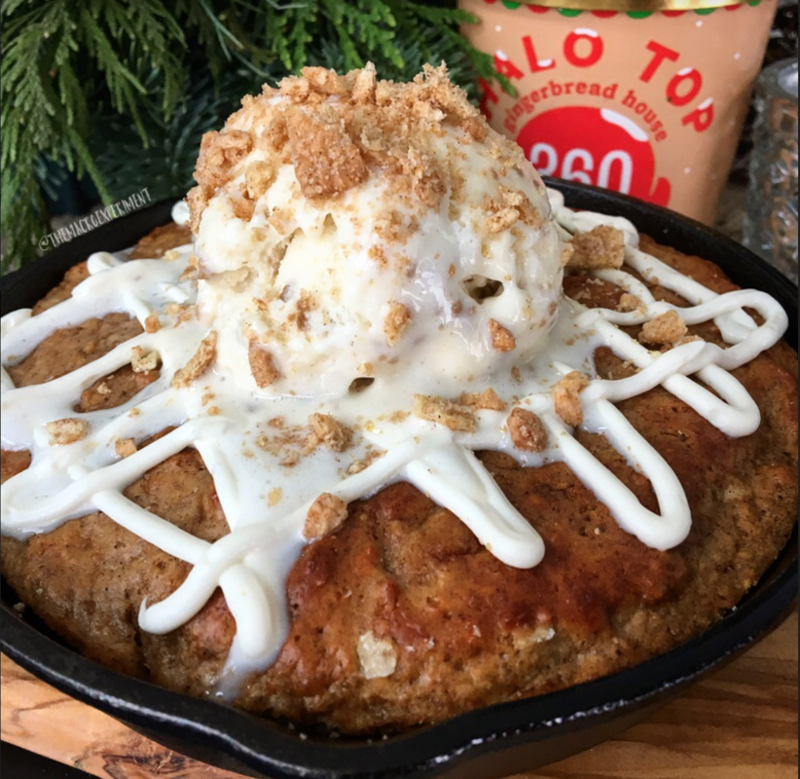 This goes great with a scoop of gingerbread halo top ice cream on top! 1. Melt chocolate in large mixing bowl and slowly stir in 100g vanilla whey. 2. In another mixing bowl, combine pumpkin, 50g vanilla whey, and stevia to taste. 3. Line cupcake pan with 7 cupcake foils and fill each with half of the white chocolate mixture. 4. Freeze for 2 minutes. 5. Spread a pumpkin layer on top of white chocolate layer and freeze another 2 minutes. 6. Top with the rest of the white chocolate and enjoy! Keep fresh in the refrigerator and feel free to share this recipe with your friends! Happy November y'all! You asked and so you shall receive! Make sure to follow me along on Facebook and Instagram because I will periodically ask you guys for what recipe you'd like to see next, which is why I decided on this one! 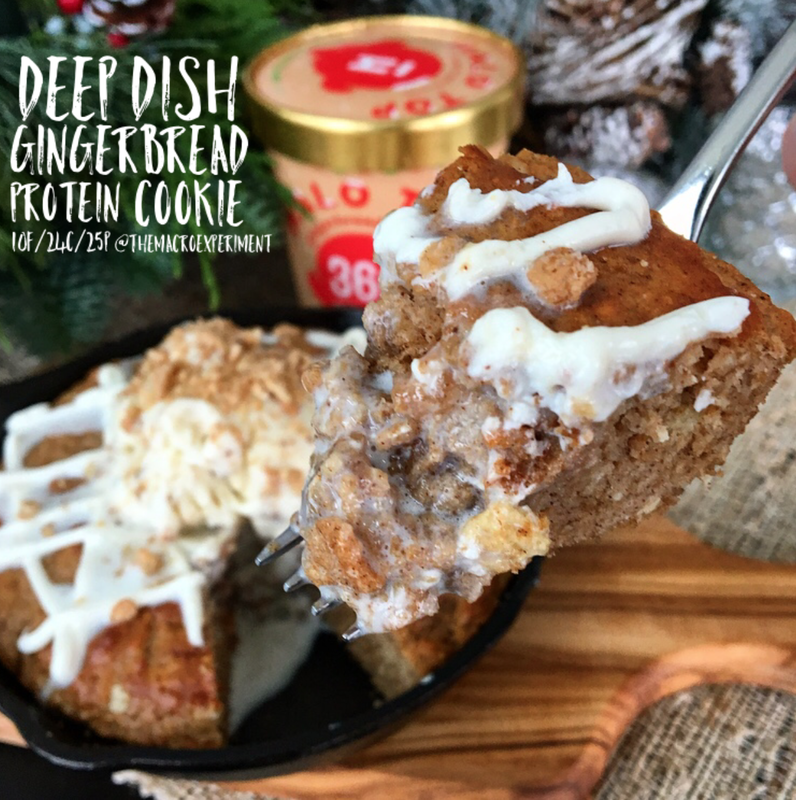 Grab your high protein pumpkin spice latte and enjoy a piece of this delicious pumpkin bread without breaking the macro bank! 2. Melt butter in mixing bowl and let cool until room temperature. 4. Pour batter into small greased loaf pan and bake for 30-40 minutes until you can stick a toothpick in the middle and it comes out clean. 5. Feel free to add a "protein icing" on top (protein powder + a few tbsp of water mixed to icing consistency) and enjoy! 2. Make sure eggs sit out for a few hours so they are at room temperature before starting. Separate yolks from whites and place whites in mixing bowl (kitchen aid is perfect for this). 3. Add cream of tartar to whites and blend with whisk attachment on highest setting for 2-3 minutes until egg whites become stiff and peaks form (similar to the Angel Foodcake recipe). 4. Place a generous amount of cheddar cheese powder in a large bowl; you'll want to use more than 36g as this is the amount that actually sticks to the egg whites. 5. Using a piping bag with a large circular tip, pipe long, cylindrical "cheeto" shaped stiffened egg whites onto the cheese powder. Depending on how big the bowl is, you could probably do 2-3 at a time. 6. Using a spoon, lightly toss extra cheese powder on top of each cheeto so that all surface area is completely covered. TIP: use the negative function on the food scale if you are wanting to keep track of the actual amount of cheese powder used for your recipe; mine ended up being 36g. 7. Gently transfer each cheeto onto a baking sheet lined with foil and sprayed with 0cal nonstick spray. 8. Bake for 10 minutes and enjoy! Make SURE to eat these when they are fresh out of the oven!! They definitely are not as tasty when cold in my opinion. If you are wanting to save some for later, keep covered and refrigerated. 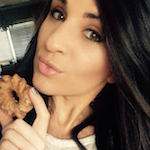 Also, if you are wanting some more fun macro-friendly recipes by me, check out the other recipes on my blog as well as AvatarNutrition.com, where I've written almost 300 of them!! In other news, last weekend I had the pleasure of meeting an IG friend that I've had for 3 years now but have never met in person. She came to visit me in Nashville and we had a blast! As much as instagram can be annoying at times, I would say the good outweighs the bad by far. I have been able to connect with so many awesome, like-minded people online -- aka YOU reading this! I hope one day I can hug every person who takes the time to read my blog! Forgive me friends, for I have marked "non-compliant" this past week on my avatar check-in! I actually think it's a pretty cool feature, because if you mess up and go over by a lot (or under but lets be real who even does that?!) you won't ruin the algorithm's adjustments. So yeah. I got my period and became a ball of emotions (note anchorman quote in title lel) and had a day where I went over by quite a bit! I also tweaked my lower back and shoulder lifting this week. It's so bad that for the first time in a few years, I think I am going to take an entire week off to let my body completely heal. I will do some light cardio here and there to stay active, but yep. The one redeeming thing that happened was... I got to see my dear friend Christine compete at the Tennessee State bodybuilding competition here in Nashville! So guys, back on track this week! No beating myself up about it. Let's rock!